The fundamental weakness is the same one that has continued to plague a number of Ancestry programs allegedly designed to ‘assist’ people in finding their ancestry on all their family lines. Thrulines, in its analysis and suggesting, even attempting to insert ancestors for users, combines the DNA tests and related DNA database WITH ‘member trees,’ even though the vast majority of member trees uploaded to ancestry are either undocumented, poorly documented or even outright fantasy and myths. Most Ancestry ‘member trees’ are NOT very accurate, beyond three or four generations, where the person creating the trees might have actually known the people put into the trees and/or have recent documentation like actual census records and copies of vital records. Worse, Ancestry tries to alter family trees and suggest ancestors based on the number of existing trees–documented or not–that have the same ancestor. In the most egregious instances of this absurdity, mythological ancestors well documented by modern research to be either not the ancestors of lines, or not even to exist, have been inserted or strongly suggested by ancestry, superceeding better researched and documented individuals. Ancestry has been, and still is being, repeatedly accused of substituting its own agenda and even databases that are not documented, such as many IGI databases, themselves not well-documented, and ‘summaries of ‘marriage records’ and such’ based on mere citation of persons as husbands or wives, in members’ trees. Yes, Ancestry personnel can and do alter members’ trees. These Ancestry-LDS databases are treated as equal to solid research and documentation. This all violates numerous rules of scientific and scientific historical research. No professional academic, nor real scientist would consider these databases, a solid body of evidence. They would not consider as accurate any claim or report built upon them. The problem is, Ancestry is in strong joint ventures with Family Search, which actually is the entity digitizing and uploading most older microfilm and records collections. Family Search is an affiliate of the Latter Day Saints CHURCH, which has a ritual in which all members are expected to participate and perform: identifying all RELATIVES, not just ancestors and baptizing, in absentia, all the ancestors and relatives to ‘get them into heaven.’ For a long time, up to the present, there has not been a uniform, verified and well-enforced standard of accuracy and insistence on use of primary sources and valid secondary sources and related primary and secondary documents, to firmly establish ancestors for even the LDS church purposes. Speculation entries of persons into trees, based on limited documentation, or similar names in the expected places has been widely tolerated. Copying other persons’ trees, without checking the documentation has been tolerated. The result is a huge database of millions of family trees that are mostly inaccurate, especially before great-grandparents’ generations, but are treated as valid, and even preferred. The LDS Church interests have been observed again and again to predominate most Ancestry programs that they claim are to try to link families and assist finding ancestors. If truth and accuracy are important to people, particularly if they are using family trees to determine probabilities of genetic illness, probabilities of outcomes of treatments, and more, then Thrulines is unlikely to be more than marginally helpful, and only for the most recent few generations in your family. Mercifully, it does not go back more than 7 generations in ‘analysis,’ though it wants to suggest you put into trees ancestors from trees that do go further back. However, as some have suggested, it really ought to really be strictly limited to four generations to have much real value as an automated assistance program. Until Ancestry, and other companies separate the well-documented and verified trees from the greater amount of chaff of the undocumented, and copies of copies of undocumented, trees, and ‘popularity’ of numbers of the same trees, the huge database of ‘garbage trees,’ mixed with the small percentage of valid trees, will continue to hamstring anything else that combines all the trees with real documentation and DNA testing to automatically identify ancestors. The best way to use ancestry’s DNA databases right now is to identify the DNA matches, according to one’s interest in particular lines and generations, using the numbers of matching centimorgans, and if possible chromosomes where the segments of centimorgans match, and finding the trees in the matches that ARE well documented to look for possible common ancestors where they are expected or suspected to be. People need to create their own databases that link DNA matches with DOCUMENTED trees among those matches. They also need to read the documentation and make sure it is a real document, such as a marriage record with a citation of a county record number, and that it really matches the person being described, for race, age, place, etc.. There are plenty of instances where someone has grabbed a draft record, or obituary, without reading it and applied it to the wrong individual, as proved by all the other documentation in a tree. 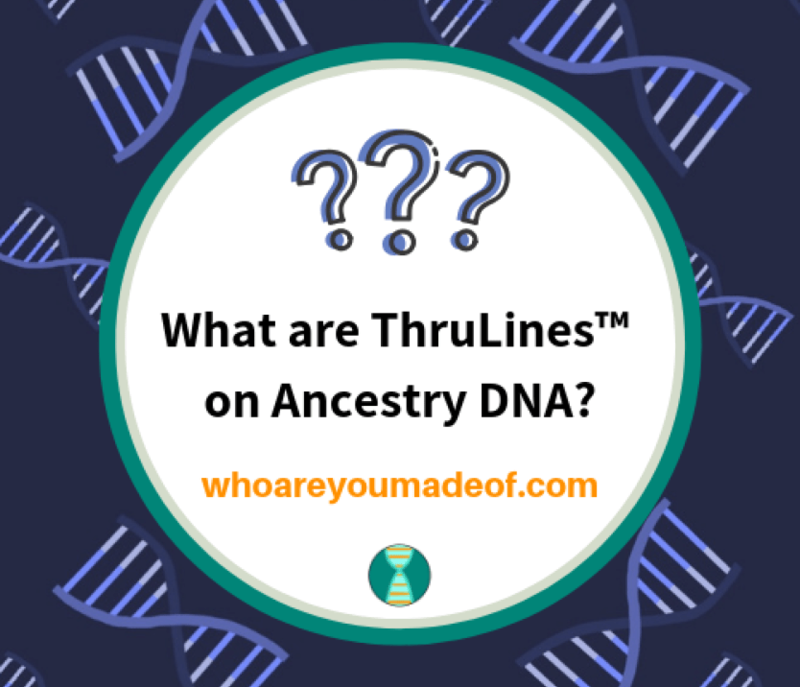 Ce Ce Moore and Henry Louis Gates of the popular PBS television program ‘Finding Your Roots’ are far more careful about matching real documentation to people and combining DNA with actual, documented trees than Ancestry’s automated assistance programs like Thrulines are, or have been. Pay attention to what Ms.Moore and Professor Gates are doing and how they are doing it, to be more accurate in the trees and histories you create. Also pay attention to their caveats about accuracy of documents, and that some conclusions are only being tentatively made on the basis of limited, not complete, documentation and that documents that may be found later may alter the conclusions. Ms. Moore and Professor Gates are professionals and really do assist people. Ancestry has yet to value and achieve that standard. 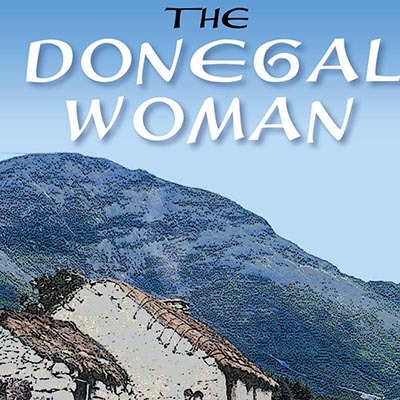 The Dark Side of What Ireland, England and Germany Brought to the U.S.
Just before the start of the ‘Me Too’ movement, Irish author, John Throne decided it was time to reprint his 2006 novel, The Donegal Woman, about his late grandmother. The novel is fictionalized because he never actually knew his grandmother and she died young, leaving no written records or journals about herself. This novel is actually a very powerful, harrowing, emotion-and thought-provoking, true tale about what it was like to be a poor girl and woman in Ireland just before World War I (hardly ancient history) and even afterward for some years until women were given rights to vote, to own property collect their own wages, and more. This story is not unique to Ireland. Any family historian who significantly delves into the lives of women and girls in the U.S. sees that precisely the same things happened, all over the U.S., especially between the period of 1783-to the Civil War, ‘America’s Dark Age’ and beyond. In fact, it continues in parts of the U.S. to this day, more rural and small town areas of Kentucky, Arkansas, Tennessee, the Carolinas, the deep South, Utah, even rural areas of California. It’s no surprise to any who have studied the cultures of those that emigrated, and who know what was the culture before emigration. The emigrants brought a lot of what they’d lived with before, to the newly created United States of America, and made it part of American culture, especially among the poor and lower socio-economic classes, and on the frontiers of the white European civilization and populace.. It was no wonder that often women and girls captured by some Native American tribes in frontier warfare chose not to go back to the white European culture. In his preface, the author, John (Sean) Throne, explains that he changed the surnames of the subjects, saying that he didn’t think their names mattered any more. Since reading his book, I have communicated with him and, if we have one minor disagreement, it is that he should not have done so. It’s just my personal opinion, but I think changing their surnames misses an opportunity to discourage the evil deeds his book presents so powerfully from being recommitted, whether within a family or the country, and by anonymizing these long dead miscreants, it allows their descendants to think better of them than they should, rather than making them bad examples for the evils they truly perpetrated. Many years ago, the author of the partly tongue-in-cheek book Leadership Secrets of Attila the Hun, had Attila say, ‘every Hun has his purpose, if only to be the example of how NOT to do something.’ It is applicable to all humans, not just the ancient Huns. Worse, the attitudes and culture that abused so many women and girls, as shown in this book, were reinforced by a state-affiliated Church, a patriarchal Church, that had sold its original Leader’s ideals and goals for money and power and bent to might of arms. The Christian church, both Catholic and Protestant, reinforced attitudes and structures, that though abusive, had been in place since before the Christian church, under the ancient empires that had come to be, ever since men developed metallurgy and better weapons and had more leisure time to steal from one another and make war. Make no mistake in understanding that: all organized religions with buildings and power, especially those run by men, have used force of arms to maintain themselves as they see fit. In this book itself, the Church itself orders men to physically drag the girl away from one form of slavery to another, from one male master to another. The girl is tiny but her father does not even bother to check what work she will be doing and how she will live at her employer’s home. She is turned out, and made to walk, unescorted, carrying a small napkin with some bread, and her only other dress, the several miles to the new owner, whom her father met at some town market or fair–hence the name for the agreements. When she arrives she finds she is to care for the pigs and clean out the pig pen from the pig waste mixed with kicked up mud, every few hours, and mix and haul their food to them in a bucket so large and heavy she cannot lift it, but has to drag it. Then the owner’s wife complains that by dragging it, the poor girl is damaging the bucket. There is no concern for the girl, just the bucket. Within a few months she is also caring for a cow and calf and milking the cow and hauling milk buckets. Young Margaret is compelled to sleep in a dirty, unheated barn, on old coarse grain sacks and straw and handed her pieces of bread, and little else to eat, outside the back door of the master’s house. She has no means of bathing, no bed, no muckers to keep her feet clean. She has no means of washing her two dresses. She lives in filth, she sleeps in filth. She begins to smell like the animals she is tending and her masters will not even allow her to clean up once a week and go to church with them. Her father never comes to see her and how she fares. She is a slave, nothing more and she knows it, at the age of 12. She cannot leave, because then her father will not be paid and her father might beat her or turn her over to the workhouse, for disobedience. The agreement is for six months work, minimum, before pay, and to her father, not her. The Church tolerates the system, because it is the men who build the church buildings, and donate money to the support of the buildings and clergy. Then, little Margaret starts to go through menses. The inevitable happens between master and slave in a system that has no protections for women and girls. The large brutal master rapes the 13 year old girl as she is trying to get a few hours sleep in the filthy barn, and beats her senseless at times, to keep her from screaming and being heard. The trauma of these experiences causes her to lose her voice, for years. She becomes pregnant, and finally that comes to the attention of the local church, who find this an embarrassment. The Church blames the girl, but decides the way to cover this up is marry her off to a much older local bachelor, as single males are also frowned upon. Procreation means more cheap workers for the wealthier larger land-owners, and more in Church donations from both the poor made to feel like they need to give, little as they can, and the wealthier landowner employers who are paying as little as they can for their labor. The slow realization of these various characters, of how this rigid feudal socio-economic hierarchy abuses them, and how the Churches are such an integral part of the system, even help enforce it, are key elements of the book. The reactions are different among the characters. Their various reactions lead to growth, and spiritual, mental and emotional healing to some degree, within what she can control, for Margaret, as she transforms from girl into wife and mother, and stagnation and shrinking of her appointed husband.. He continues to go along with the status quo, in nearly every way, and pays bitterly, more and more over time, though he is very slow to realize this. Margaret finds ways to take control of her life as she can and finds some happiness along with the misery of a loveless, often abusive and neglectful marriage. Although this a book about Protestants, two Catholics who befriend poor Margaret, state that such abuse was just as likely to happen among the poorer families in Catholic parishes and communities of rural Ireland. We are now learning, that, even after Ireland’s independence, much of this abuse continued, as De Valera and his supporters made Eire itself another theocratic state for several decades. The rights of women were only minimally allowed to develop. Additionally, as we now know from the headlines in the media resulting from recent investigations, that the Catholic Church in Ireland had another cruel way of dealing with unwanted pregnancies. Unwed, pregnant Catholic girls were usually forced to go to ‘Magdalene Houses’ run by nuns and others and sign away their children and never see them again at birth. Their families were not encouraged or allowed to keep and raise the children. Emer Martin’s recent book, The Cruelty Men, centers on this theme. Under this system, the children of unwed mothers, no matter how they were conceived, were a shame upon the family and ‘good Catholic communities.’ Many hundreds, even thousands, of these poor little children, died of neglect and privations. There were mass graves with no markers, nothing to remember them, outside some of these orphanages. The mortality rate was much higher for children in these ‘homes’ than for children in families, even poor families with little sanitation and hygiene. The Catholic Church literally treated these poor babies and young children as though they were the sins, and murdered them, as surely as if they had strangled or smothered them and been seen to do it in public. It’s called infanticide and it is just as much murder as any other form of it, and it was institutional and practiced by the Catholic Church from one end of Ireland to the other. On his trip to Ireland last year, the Pope recently had to publicly apologize for these evils, but apologies are not enough, as both families and mothers who remember their stolen children, and the survivors who were the children themselves, have both bitterly and repeatedly stated. Both books, The Donegal Woman, and The Cruelty Men are topical and significant because the ‘Me Too’ movement has erupted out of continued, 21st century abuse of women working in many fields, including entertainment. It is significant because right now, because too many men in the U.S.–and their Churches–are not content with just doing everything they can to ban abortion, and cut food stamps (SNAP), milk and baby food and clothing for infants (WIC), and other support for poor families with too many children, as though children should be put to work as slaves as soon as they are born, before they can walk or speak. There are men in Congress, and men who vote for them in many parts of the U.S. who now want to also eliminate ‘Title IX’ protections for women and girls in schools as well as sports, and other fields–and to eliminate affordable birth or free birth control–not abortion–but birth control, for those who need it most and can afford it least. It’s literally an effort to return to just creating more poor workers, the cheapest labor, possible, and to heck with the quality of their lives, especially those of women and children. If all life is precious, and not just the life of a fetus’ still in their mothers’ wombs, then this is a shameful, complete hypocrisy. Yet, again, just as in 1912, so-called ‘fundamentalist’ Churches who claim to be ‘Christian,’ as well as many in the Islamic world, continue to support these attitudes, votes and practices. They have not changed; they are still the abusive, misogynistic human entities run by men that they have been since Rome, Greece, and Persia–even before Islam or Christianity came to be. I recommend reading this book to all women, and to the men who truly care about their wives, sisters, mothers and and daughters and to to talk about it and learn from it. 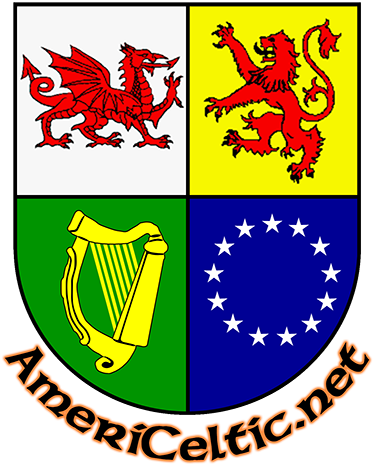 Ask yourselves this: was the old Europe, the old Ireland, of as late as 1912 to 1919 so great that this what you want the U.S. to return to, and become? If not, I have a few suggestions. Vote against the attempts to return the entire nation to this culture and teach men and women that just bringing more workers into the world only means the employers can get away with paying less for labor, especially as more and more labor is being done by robots. Vote for more women, and men, who will actually fight for more rights and opportunities for women and children, and to protect them from abuse–and who have a track record of already doing so as much as they can. Help teach your sons, brothers, and other males it is THEIR responsibility also to control themselves, not solely the responsibility of females. Keep reminding them that Christ, and in fact, most of the greatest founders of what became religions, did NOT create the structure of churches and clergy, and set male power only or mostly in them, but human beings, that fallible human beings created and run the religions, and they are no better than any of the rest of us. You can and should also write and vote for a statewide ‘initiative’ to amend the California Constitution to require that all girls get at least two or three years of self-defense training, like karate or judo, starting in kindergarten, and refresher courses every few years until high school graduation, and at least a couple of forms of weapons training by age 11 or 12–when most start menses. If you don’t live in an initiative state, then vote for state legislators who will make this law in your states. Remember, for the most part, the members of Congress who can help or harm women and children started, and continue begin their careers as state legislators. If you don’t insist that your local elected officials and state legislators treat women and children with respect and care, then why would you expect any better when they get to Congress? Also, teach females and males that drinking to excess and losing control over one’s self or finances is bad, at any age, and good nutrition makes them stronger. Teach them that all children, up to the age when they can hold a decent well paid job deserve protection, nurturing and care, not just the males, and not just when they are still in their mother’s wombs. There also must be opportunities for higher education and well paid jobs and careers for females as well as males. Finally, it is up to fathers as well as mothers, and the accepted, self-acclaimed religious authorities, to help protect and nurture children–and assist and care for their mothers. Another thing shown by these books is that, being a mother, especially of pre-school age children, is a full time job all in itself, especially when also doing all the care of a home, gardening and, sewing a lot of clothing, and it’s all unpaid. The same is true for caring for a single pre-school child at the same time as an elderly parent with declining physical and mental capabilities–it is effectively caring for two children. If this is of value to men, then it is up to them to work, earn a decent amount to support themselves and their families and finance the the work of the wives and mothers, and yes, when those wives and mothers are ill, to also help care for them and the children, not just let fall down from exhaustion and illness and then die of neglect and ignorance, or rely on small children to know what to do for their mothers and care for them entirely–as well as each other. If your wives and children are important to you, if only as labor and potential labor, then shouldn’t you be caring for that labor and helping make it strong? Shouldn’t you understand what all is needed to survive and thrive and help to provide it? Ask yourselves this: What good are men to the human species if all they care about is themselves, as individuals, and their status in relation to other men, and their power over all that is deemed by males as inferior, which includes more than two-thirds of the human population? Last, but not least, don’t ever confuse God with the religious structures of men–and don’t let religion and social hierarchy become combined with government, law enforcement and criminal punishments. In 1912, rural Ireland, wasn’t much different than Pakistan, Saudi Arabia, Iran and other Islamic theocratic states are today, especially for women and children, more than half of the human population. God didn’t create 3,000 years of abuse, violence, and exploitation, men did, and then have avoided and denied their responsibility for all the harm they have done and excusing themselves and blaming others–usually their victims–ever since, in all aspects of human life. Women, you need to start holding men responsible for their own actions, and the harm they create, including in all institutions they dominate and use to maintain power and abuse, business, government–and Churches. Remember little Margaret Wallace-Campbell, because if you don’t pay attention, care, and fight back, your own daughters, or grand-daughters, could be the next Margaret’s in the 21st or 22nd centuries. 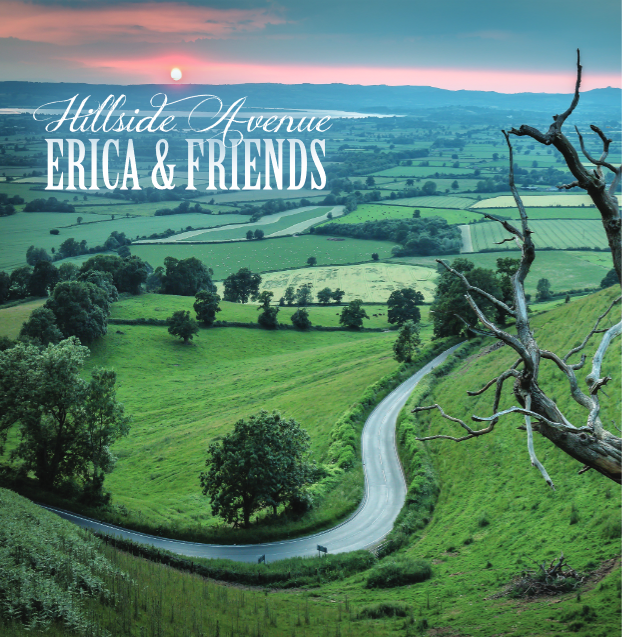 The brand new album, Hillside Avenue has been anticipated for some time, and now it is finally here! For people who have had the pleasure of listening to Erica and Friends live, this album lives up to their best work. The pieces are familiar, their favorites; the arrangements are new but well-polished. Erica Hockett and her ensemble are perfectionists and the album is excellent all round! You will be happy to buy and enjoy it many times over. Erica has always had a sweet, clear voice and on this excellent album, it is better than we have ever heard it before. As we listened to Hillside Avenue for the very first time last Thursday, August 30, 2018, we had just been watching Senator John McCain’s services in Arizona, and Senator Joe Biden’s stirring eulogy. We appreciated these lovely old ballads all the more for the context. Celia really was brought to tears by Erica’s rendition of Garden Valley and its remembrance of a ‘Gallant Laddie,’ and as she thought how appropriate it was in the context of the day. Troy Dillinger has a wonderful touch with his piano accordion and it added greatly to the upbeat pieces. The band’s Chris Hammond on guitar and Anne Bingham Goess on fiddle, and whistle, all comport themselves with skill and style for a full instrumental sound that accompanies song, jig and reel to perfection. Erica grew up in the English Cotswolds listening to the English folk band Fairport Convention, and we were expecting at least one of their hits, but were very pleasantly surprised to hear Erica’s rendition of Farewell, Farewell, written by Richard Thompson and first released in 1969 by Fairport Convention. We especially like the carefully crafted new arrangements for these traditional ballads, jigs and reels. These new settings will give even the most jaded traditional music aficionado’s something new and pleasing to hear. Sound engineers, Margrit Eischler of Absolutely True Sound and Gawain Mathews of Gawain Mathews Music Studio (who also plays loads of instruments on the album) have done a fantastic job on this one. The mix is great – not too much compression or reverb, so the presence is just the way we like it – every word is audible, yet so are all the nuances of the acoustic accompaniment. You can see and hear Erica and Friends live at the Scottish Games and Gathering in Pleasanton this coming weekend, Labor Day weekend, Saturday and Sunday, September 1st and 2nd, 2018, at the Alameda County Fairgrounds. They will have CD copies Hillside Avenue for sale as well, so you can keep enjoying their music. We’ll also gladly look forward to their future albums! For more on Erica and Friends, check their Facebook Page here! Enjoyable, Eclectic and now Available! In past 18 months, Santa Cruz collaborative Charmas has successfully used Kickstarter to fund their albums, Songs of the Sea, which proved to be a landmark collection, and now Stark Raving Celtic. Stark Raving Celtic features twenty Central California musicians, wielding an astonishing variety of folk-, rock-and percussion-instruments, who are give the album exceptional creative variety. 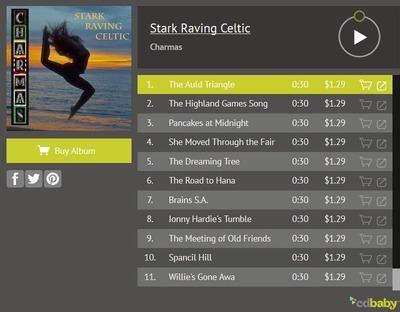 The result can be heard on Charmas’ brand new album Stark Raving Celtic, which features original Celtic music and performances by 20 past and present members of Charmas as well as notable guest performers. Stark Raving Celtic includes several lovely tune sets, but there are not many Scottish/Irish/Celtic bands who compose original songs about their life experiences in the traditional style, and although we liked all the tunes and songs well, for us, these four original songs stood out. We’ve been to many Scottish Highland Games, and so we especially appreciated the humor and liveliness of The Highland Games Song, by Elise MacGregor Ferrell, and the extra vocal effects of the lads singing it. It should be the theme song of California Highland Games in general! Speaking of Scottish Games, the bagpipes there can be overwhelming, but the bits of bagpipes that Elise plays in several tracks of Stark Raving Celtic fit pleasantly with the instrumental arrangements and medleys. The Dreaming Tree, composed by Elise as a elegy for the authentic and tragic life story of ‘Kathleen of the Great White North’, is made all the more poignant by the distinctive voice of emerging star Lee Corbie-Wells. Keep your eyes and ears open for more from Lee. Brains S.A., written by guitarist Jim Powell about an evening at a pub of that name in Cardiff, Wales, brought to mind a couple of memorable visits to a pub we used to know in St. Paul, Minnesota, as well as an old song by a long-ago favorite British group (‘The Inn of the George and Dragon’ by Herman’s Hermits). I couldn’t help but smile when Jim mentioned the Welsh dragon breathing fire down my back. Jonny Hardie’s Tumble, composed by Elise for Old Blind Dogs fiddler Jonny Hardie, was a lovely tribute and a rollicking tune, made exceptional by the wonderful, rich tenor-baritone voice of lead vocalist Aaron Clegg. Aaron is among the best we’ve heard. His natural, strong voice is accompanied by emotion, especially humor, you can feel, and his excellent enunciation stands out over the accompanying instruments. We can heartily recommend Stark Raving Celtic to anyone as an enjoyable, eclectic experience. To hear samples of any the Stark Raving Celtic tracks, click on this CDBaby Player link, Charmas Stark Raving Celtic Player, and scroll down to select that Track. 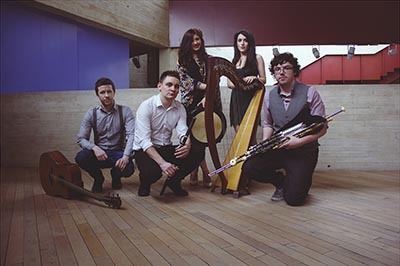 Connla is a new, young Northern Irish band, which has been called ‘the best new trad band’ from Northern Ireland but is much more than that. It is gaining recognition in the U.S., with rave reviews from such entities as the ‘Chicago Irish American News,’ as well as winning awards in Ireland. It is comprised of four young people from Derry and Armagh; Ciara McCafferty (vocals), Ciaran Carlin (Flute/Whistles) and Paul Starrett (Guitar) Emer Mallon (Harp) and Conor Mallon (Uilleann Pipes/Whistles). Connla was described as a ‘must see’ group by ‘Songlines Magazine,’ a magazine out of the UK that covers world-wide music and has taken over awards presentation from the defunct BBC music awards. We listen to a few dozen new album’s by various, very good, groups every year, and recently listented to Connla’s newest album, The Next Chapter just released last Friday. A few of these really stand out to us, and this is one of them — even better than Connla’s 2016 album, River’s Waiting. Although the band considers itself ‘trad,’ it has a generally modern presentation that is refreshing. Connla’s music also includes touches of Jazz, Pop, a fair amount of Latin or Spanish influence, especially in pieces where guitar dominates, and even Americana. The song ‘Julie‘ about a U.S. Civil War period relationship between mistress and a long-time slave while the Union soldiers are approaching, is unforgettable. Both album’s have an interesting mix of modern and traditional ballads, and traditionals and more modern instrumental music. The instrumentalism is excellent. I really enjoyed the guitar-dominated pieces. It is so seldom one hears virtuoso melody guitar. ‘SS Baychimo‘ was truly special. It reminded me of some fine classical performances of Spanish music like ‘Recuerdos del Alhambra,’ or ‘Romanza.’ and a good reminder of how many Irish went to the Spanish speaking countries after 1641. Wow! Ciara McCafferty’s voice easily rivals the best of Nashville female singers. It is young, sweet and strong. The ballads she sings tell stirring, poignant tales that catch your attention also. If I have one complaint, it is that Ciara would enunciate her consonants and the mix better balance her voice when she’s dropping the volume for dramatic effect. Sometimes she’s crystal clear, even above the instruments, and other times, the ends of words disappear a bit, especially when her voice is dropping while the instrumental music is swelling, as in the very end of ‘Julie.’ Over time, I’m certain this will only improve. Connla is touring the western U.S. in September and will be featured at the KVMR Celtic festival on September 29 and 30 in Grass Valley (east of Sacramento off Highways 49 and 20). In the preceding week, they will be in the Bay area (in Berkeley) and we hope to find them a gig in the South Bay area as well. AmeriCeltic readers should get out and listen to them, where and when they can! They are well worth the prices of the tickets! We’ll publish all their dates and places as they develop closer to their tour. Meantime, we can recommend their album as a lovely diversion during our long bay area commutes. For more on Connla, check their website, www.connlamusic.com, or Facebook Page www.facebook.com/connlamusic, or watch their Promotional Video. More Tie-Dye melded Celtic music than ever! 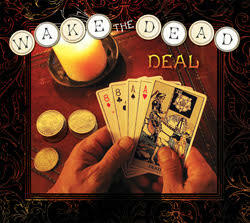 Wake The Dead is a cadre of multi-talented musicians lead by Danny Carnahan that has been moshing Hunter/Garcia’s malleable and durable songs with traditional Celtic jigs and reels for better than three decades. On this latest album, The Deal, they add songs from the Youngbloods, Buffalo Springfield, Bob Dylan, the Beatles and more. The performances, by Maureen Brennan, Celtic harp, Cindy Browne, double bass, Danny Carnahan, vocals, octave mandolin, guitar, fiddle, Kevin Carr, fiddle, uilleann pipes, pennywhistle, Sylvia Herold, vocals, guitar, Paul Kotapish, vocals, mandolin, guitar, jaw harp, Brian Rice, hand percussion, are all wonderful, but then every one of these are masters of their art. The tracks are likewise incredible. Note how these classic songs are carefully paired with Celtic traditional tunes like a fine wine with a great entree! Surprisingly, my personal favorite is Bob Dylan’s Just like a Woman, because of the sensitive treatment given by vocalist Sylvia Herhold, but overall it’s another great album and a MUST for any 60’s folk-rock fan. Another great track is the first, where the rollicking country-bluegrass-rock fusion number, Cumberland Blues by Garcia and Lesh is paired with Mind the Gap, an original tune by Danny Carnahan, and together, they blend beautifully into a classic old-time anthem. There is plenty of variety here to please almost any traditional music fan, probably including you. You can listen to samples at www.wakethedead.org/product/deal/ and purchase a download right from the site.